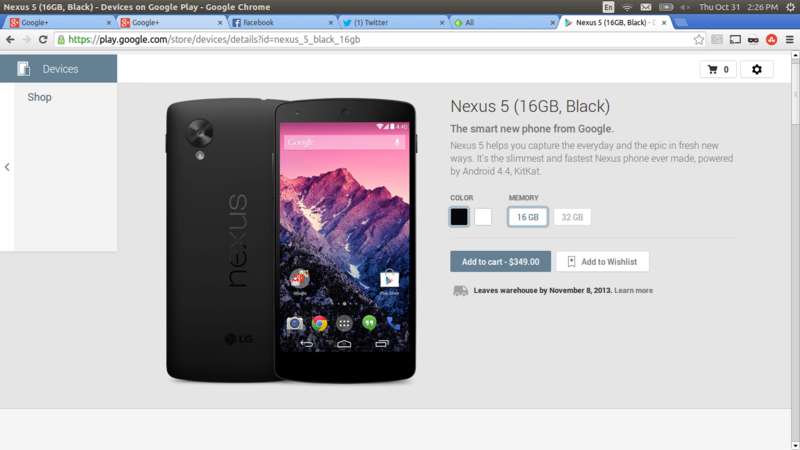 The Nexus 5 is now official. After all the leaks, rumors and nonsense, you can now get your hands on the LG made handset. Sporting a Snapdragon 800 and coming in 16 GB and 32 GB varieties, this is a great phone for the price. Nobody can argue the bang for the buck here. Lacking from the Nexus 5 are the features of the Moto X. This should surprise exactly no one. Lots of people are talking about whether or not always listening is present in this device, and it’s NOT. Activating Google Now’s voice recognition and control requires the device to be awake, with the screen turned on. This will not work as the Moto X does, with the device on standby. Before anyone freaks out, ask yourself this: Why would Motorola features be present in a LG handset? The Nexus 5 was manufactured by LG, not Motorola. Yes, it was in partnership with Google. This is another reminder that just because Motorola is owned by Google, they are NOT the same company. Touchless control in the Moto X is handled by special custom processors Motorola designed for the X. The processors are designed to be extremely low powered to help conserve battery life. LG does not make these chips, therefore this would not and should not be present in the Nexus 5. As far as active notifications go, this is another rumor that proved not to be true. Why would it be? The Moto X uses an AMOLED display that allows for only the pixels you need to be turned on. The Nexus 5 sports an IPS display that lacks that capability. If active notifications were present in this device, battery would suffer horribly. Now for all of this bellyaching I’m doing you’d think I hate the phone. I don’t hate it. It’s not for me. If I was in the market for a great phone at low cost, this would probably be the right choice. Many consumers are like myself. We now look to features rather than raw specs when we shop for a new smartphone. The front speakers and photo highlights of the HTC One are great for my life. Others enjoy the Moto X features discussed above. Still others love the features Samsung builds into their phones. That’s OK, and is absolutely what people should be thinking about. When you shop for a new device, the first question you should ask yourself is “How does this fit into my life?”. The Nexus 5 is a great phone, though not for me. As far as bang for the buck goes I doubt anyone could find a better option. Google and LG have done a great job to bring a very powerful and capable handset to market at this price point. I look forward to reading our official review of the Nexus 5, however I’ll be leaving that to someone else.